Agate is formed with bands of microscopic quartz crystals. It is a variety of Chalcedony. Agate is a grounding stone as well as a spiritual stone, allowing for one to bring their spiritual experiences into their everyday reality. Agate is believed to improve mental functions and can help where issues of clarity and stability are concerned. Agate is also helpful in overcoming negative emotions by bringing love into the chakras. Although they work very slowly and deliberately, this gentle nature of Agate helps it to have a lasting impact.white Agate is beneficial to pregnant women, as it eases the effects of morning sickness and alleviates the pain of labor. 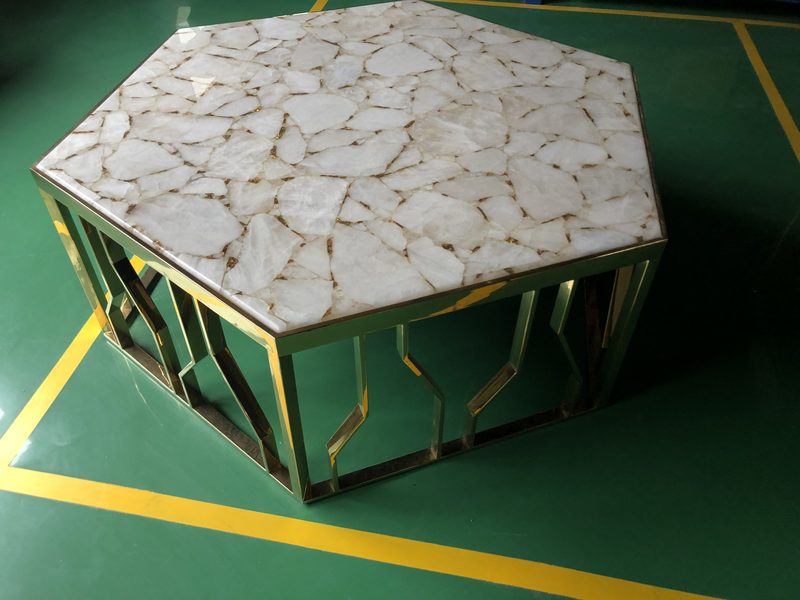 Semi precious table series-- White agate table, regular hexagon ,surface finish is polished. this model of white Agate table`s side length of table top is normally 80cm,and tabletop area is 1.663 square meter. The thickness of agate table is 2cm (normally 0.5cm white agate +1.5cm natural commercial stone or artificial stone/glass/Acrylic, size can be custom. The base also be regular hexagon, made with metal .of course you can choose white agate or wood or metal as base stand. We normally produce agate coffee table with small agate slice ,white agate is dyed color. if you prefer this agate table to be translucent, you can laminate the tabletop with glass or acrylic. Translucent white agate table is full of bright and fantastic colors and purity atmosphere. Size: side length of table top is 80cm,tabletop area is 1.663 square meter. thickness is 2cm (normally 0.5cm white agate +1.5cm natural commercial stone or artificial stone/glass/Acrylic),shape is regular hexagon(square ,round- is available) and size can be custom. Base can be as big as tabletop and size can be custom, base can made with metal, wood or just white agate as you like. Looking for ideal White Agate Table Manufacturer & supplier ? We have a wide selection at great prices to help you get creative. All the Agate Nesting Tables are quality guaranteed. We are China Origin Factory of Agate Table. If you have any question, please feel free to contact us.